Why Does Every Wall Street Strategist Think The Stock Market Goes Higher? Coming into 2011, the consensus estimate for the S&P500 was a 10% gain for the year. This would have taken the Large-Cap Index to about 1374. 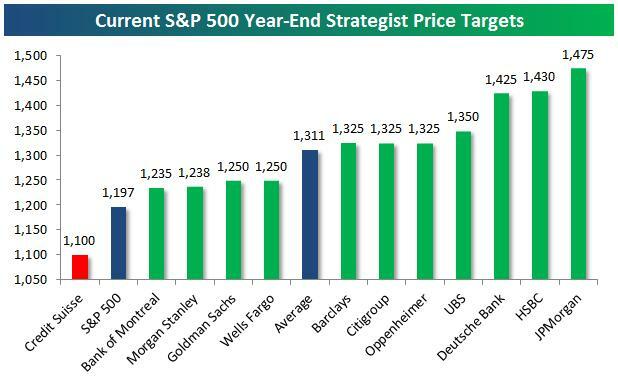 As usual, strategists have been lagging rather than leading the market with their price targets. By May, consensus was up to1406 after the S&P500 was up 5% for the year. Since then, the market has sold off pretty hard, and analysts have now lowered their targets down to an average of 1311. Behind the curve as usual. Today, the S&P500 ($SPX) is sitting just under 1200. Only one firm that was polled thinks that the market will close the year lower – Credit Suisse ($CS).